"Thou shouldst draw together for him his gash with stitching," quotes the Edwin Smith surgical papyrus. Suturing has existed since prehistorical times. Ancient suture materials included flax, hair, linen, pig bristles, grasses, cotton, silk, and gut from animals. Ant mandibles were used as needles to draw the sutures through wounds. By the 18th century, wire had begun to be used in holding together tissues. Currently, in the United States, the U.S. Pharmacopeia sets the standards that are used by suture manufacturers. Each needle has a point, a body, and a swage (the connection of the suture to the needle). Sutures themselves can be absorbable (most commonly used in the genitourinary tract), nonabsorbable, monofilament, or braided (3). The fourth or current phase of urologic laparoscopy is the re-emergence of more complex laparoscopic urologic procedures. Technology is the driving force behind this re-emergence and possibly represents the inherent appeal of minimally invasive surgery to patients. Patients who are given an option of a less-invasive alternative will in many instances opt for it, regardless of sufficient evidence to support that decision. There is growing basic scientific evidence that the patients are really benefiting from being less cut upon. The nay-saying philosophy of "why work through a keyhole when you can just walk through the door" is being eroded. FIGURE 1 ■ Roeder loop knot. FIGURE2 ■ Other types of extracorporeal^ tied slipknot configurations: (A) Roeder, (B) Duncan, (C) jamming loop knot. Advancing technology, especially tele-robotic surgical systems are now poised to further diffuse these complex laparo-scopic reconstructive methods into widespread application. entire anastomosis intracorporeally. Initially, following the general surgical adaptation to the laparoscopic cholecystectomy, urological and other advanced laparoscopic procedures associated with reconstruction were attempted. There were no specifically designed intracorporeal suturing instruments. The problem of making instruments designed to both gently reapproximate tissues and firmly grasp laparoscopic needles has been a difficult manufacturing goal. Such instruments are allowing endoscopic surgeons to rapidly reproduce even the most arduous urologic reconstructive procedures. In the early 1990s, urologists at centers committed to advancing laparoscopic procedures persisted despite the "national decline" in urologic laparoscopy. Scheussler and Raboy pioneered reconstructive work on pyeloplasty and vesicourethral anastomoses, which laid the foundation for others to methodically begin investigations to improve instruments and methods. In 1991, our laboratories at University of California Davis began to systematically reevaluate all aspects of laparoscopic suturing, including needle design, suture types, suture colors, suturing techniques, knotting techniques, and instrument design. By 1993, we published the outcomes of some of these investigations in laparoscopic radical prostatectomy in a canine model (8). Rassweiler and coworkers have further augmented our knowledge of intracorporeal suturing and knotting, and continued to stress the need for "skill" development (9). 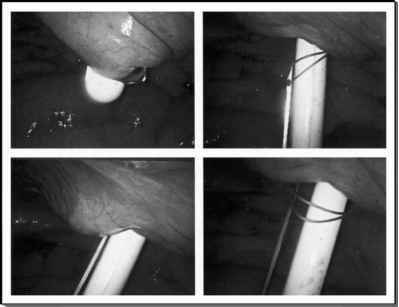 Szabo and coworkers from the University of California San Francisco, began to develop instruments and methods of training endoscopic suturing. Their intent was to promote a wide range of endoscopic procedures. By the middle and late 1990s, instrument manufacturers were becoming increasingly aware that suturing instruments, in particular, needed to be designed to overcome the barriers limiting laparoscopic reconstructive surgery (10-14). Studies investigating the ergonomics of instruments and their effect on surgical performance were increasingly being published. Table height was evaluated and was shown to influence both the dexterity and efficiency of suturing (15). Finally, the methods themselves by which a surgeon learns have come under scientific scrutiny. How surgeons learn skills and how competence is measured has fostered many recent investigations of laparoscopic suturing. Perhaps some of the most exciting areas in all of surgical research currently are focusing upon methods of surgical skill acquisition (16). Clinical series with advanced reconstructions include Kavoussi's pyeloplasty and Guillonneau and Vallencein's work on radical prostatectomy with sutured vesi-courethral anastomosis. These techniques have had rapid proliferation in the urologic community, with a large number of secondary centers beginning to report on their own respective results. No longer are advanced laparoscopic techniques within the sole domain of the endourologists: urologic oncologists are rightly reclaiming some of these techniques as their own and fostering further clinical applications (17). Advancing technology, especially tele-robotic surgical systems are now poised to further diffuse these complex laparoscopic reconstructive methods into widespread application (18). In a recent review of the past decade's experience with laparoscopic surgical procedures from a single "cutting edge" institution, Costi et al. have noted that the quality of laparoscopic surgery has improved. They reviewed 3022 consecutive patients undergoing 99 different laparoscopic procedures at the Institut Mutualiste Montsouris in Paris over the past decade. A complex database included the types of laparoscopic procedures, conversion of access, duration of the surgery, complications, further hospitalizations and reoperations, and duration of the hospital stay. General trends confirm more difficult laparoscopic surgery performed in the latter half of the decade and fewer easier procedures. In addition, evolution of the surgery itself was demonstrated by the development of new procedures. All of this was noted without a significant increase in the number of complications (19). Laparoscopic urologic surgery is accomplishing the same fundamental operation as would an open incision, except with electronic imaging and small, fixed portals of access to the closed environment. The laparoscopic environment makes suturing and knotting a most difficult task.